As a general rule, autos owned by a business should be insured under a business auto policy and vehicles owned by an individual should be insured under a personal auto policy. An exception applies when the business is a sole proprietorship. In this case, the owner should insure both commercial and personal vehicles under a commercial auto policy. If you are a sole proprietor, you may own both commercial vehicles (like trucks and trailers) that you use in your business and private passenger autos that you use for non-business purposes. Commercial autos must be insured under a business auto policy. While you could insure your personal-use autos under a separate personal auto policy, this is a bad idea. Both commercial and personal auto policies provide some automatic coverage for vehicles you acquire after the policy inception date. Both provide auto liability coverage for a vehicle used as a temporary substitute for a covered auto that is out of service. The policies may overlap. Coverage overlaps may also occur with regard to rented and non-owned autos. Most personal policies afford liability coverage to insured parties while driving autos they don't own, including rental vehicles. A commercial auto policy covers hired autos (rental vehicles) and non-owned autos for liability if symbol 1 (or 8 and 9) appears next to liability coverage in the declarations. Duplicate coverage is a waste of premium dollars and can lead to coverage disputes, particularly when the business and personal policies have been issued by different insurers. If an accident causes injury or damage that could be covered by either policy, the insurers might disagree as to which one is liable for the loss. If you are a sole proprietor, your personal-use vehicles can be insured under your commercial auto policy via a standard ISO endorsement entitled Individual Named Insured. The endorsement adds personal auto coverage to a commercial policy. It is available only if your business is a sole proprietorship. The endorsement amends the definition of you and your to include your spouse. Your spouse qualifies as a named insured as long as he or she is a resident of your household. However, your spouse is not entitled to receive notice of cancellation. If your insurer cancels your policy it will send notice to you only. The endorsement covers your family members as insureds while they are using covered autos you (or your spouse) own that are private passenger type autos. This term means cars, vans, and pickups not used for business purposes (other than farming or ranching). Your family members are also covered while driving autos you don't own. For example, your teen-aged son borrows a neighbor's car to run an errand and is involved in an accident in which another driver is injured. If the injured driver sues for son for bodily injury, your policy should cover the claim. Your liability insurance applies as excess coverage over any insurance available under the neighbor's policy. The term family member means anyone related to you by blood, marriage or adoption who is a resident of your household. It includes wards and foster children. The Individual Named Insured endorsement eliminates the fellow-employee exclusion with regard to injuries sustained by your fellow employees or those of your family members. The exclusion is eliminated because most personal policies do not exclude suits by fellow employees of insured parties. Autos owned by family members. For example, your 20-year-old daughter owns a car that is registered in her name. Neither she nor any other family member is an insured under your commercial auto policy while driving her vehicle. Any auto furnished or available for your use or for the use of any family member. For instance, your wife's employer provides her a company car. Neither she nor any other family member is an insured under your commercial auto policy while using her company car. Any auto used in a business of selling, servicing, repairing or parking autos. For example, your teen-aged son works part-time at a garage that provides valet parking. Your son is not an insured under your commercial auto policy while parking customers' cars. 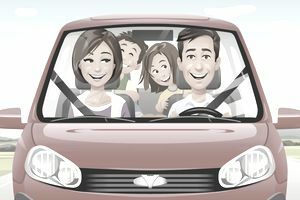 Any auto, other than a private passenger type auto, used by you or a family member in any other business or occupation. For example, your daughter owns a two-ton truck that she uses in a landscape design business she owns. Your daughter is not an insured under your commercial auto policy while using the truck. The Individual Named Insured endorsement makes one important change under physical damage coverage. If you own a private passenger type vehicle that is covered for physical damage, then physical damage coverage applies to any non-owned auto. The term non-owned auto has a different meaning in the endorsement than in the commercial auto policy. In the endorsement, it means any private passenger vehicle, pickup, van or trailer that is being operated by, but is not owned by you or any family member. The definition excludes any vehicle that is furnished or available for regular use to you or a family member. The most your insurer will pay for physical damage to any non-owned trailer is $500. To see how this coverage applies, suppose that you own a private passenger vehicle that is insured under your commercial auto policy for liability, comprehensive, and collision. Your teen-aged daughter is driving a car she has borrowed from a neighbor when she skids on a patch of ice and hits a tree. She isn't hurt but the car is damaged. Because a private passenger type vehicle you own is covered for physical damage, that coverage extends to autos you don't own. However, this physical damage coverage is excess over any coverage afforded by the vehicle owner's policy. If the owner of the vehicle your daughter was driving hasn't insured it for physical damage, your physical damage insurance should cover the loss (subject to the applicable deductible).